Namco is giving Pac-Man another chance to satisfy his hunger for dots and ghost flesh at arcades, unveiling Pac-Man Battle Royale at next month's Amusement Expo show in Las Vegas. 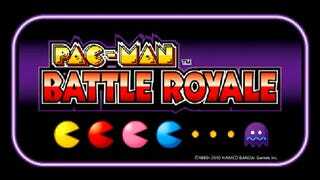 What is Pac-Man Battle Royale? It's not a fighting game in the Tekken vein, as some of us theorized, but what appears to be a four-player competitive spin on classic Pac-Man mechanics. Standard edition yellow Pac-Man appears to be just one of four playable ghost hunters, with Blinky, Inky and Pinky-colored variations of the dot eater also playable. The following video teaser doesn't reveal much, other than that the arcade game appears to be built on the Pac-Man Championship Edition backbone. One of the Battle Royale's mazes can be seen in the background, sharing the same layout and graphical style of the Xbox Live Arcade Pac-Man spin-off. And if you've ever played Pac-Man Championship Edition, you know why there's reason to be excited about a multiplayer version of that game.